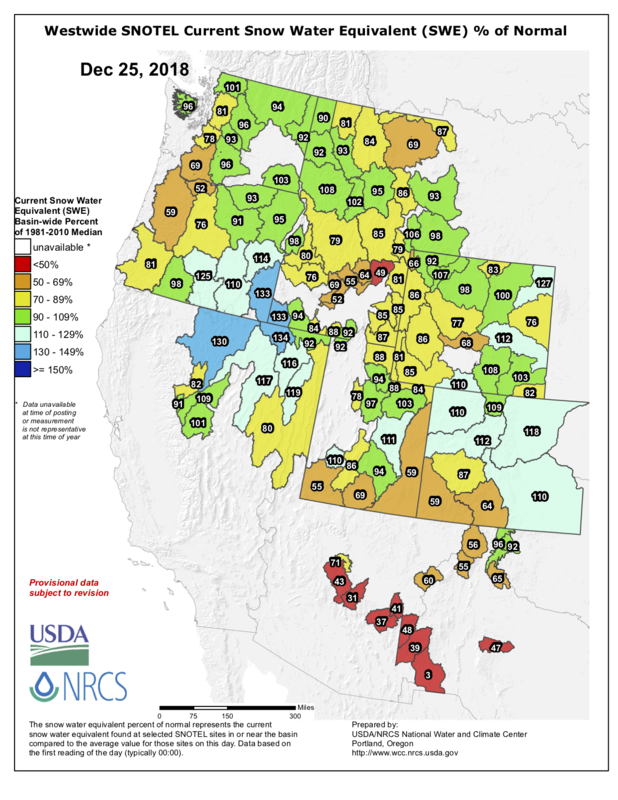 Colorado basin-filled snowpack map December 25, 2018 via the NRCS. Statewide Basin High/Low graph, December 24, 2018 via the NRCS. San Miguel, Dolores, Animas, and San Juan Basin High/Low graph, December 24, 2018 via the NRCS. Yampa and White Basin High/Low graph, December 24, 2018 via the NRCS. Arkansas River Basin High/Low graph, December 24, 2018 via the NRCS. Upper Colorado River Basin High/Low graph, December 24, 2018 via the NRCS. Gunnison River Basin High/Low graph, December 24, 2018 via the NRCS. Laramie and North Platte Basin High/Low graph, December 24, 2018 via the NRCS. Upper Rio Grande River Basin High/Low graph, December 24, 2018 via the NRCS. South Platte River Basin High/Low graph, December 24, 2018 via the NRCS. And here’s the Westwide SNOTEL basin-filled map for December 25, 2018 from the NRCS. Westwide SNOTEL basin-filled map December 25, 2018 via the NRCS. Two winter storms expected to slam into Durango in the past few days split and puttered through the region, a weather pattern that could repeat for a storm later this week. The past two storm systems forecast to dump dozens of inches of snow across the San Juan Mountains did not quite reach Durango as expected – a natural and common disturbance in the systems split the storms and sent most of the snow to New Mexico, said Chris Cuoco, a meteorologists with the National Weather Service in Grand Junction. “The northern half of the storm is starved for energy and doesn’t dump much snow,” Cuoco said. West of Durango did see some snow flurries, with up to 8 inches dropping in the foothills north of Cortez on Tuesday night and Wednesday morning, Cuoco said. Durango, however, was spared. Mancos received 5 inches from the system by Wednesday morning.